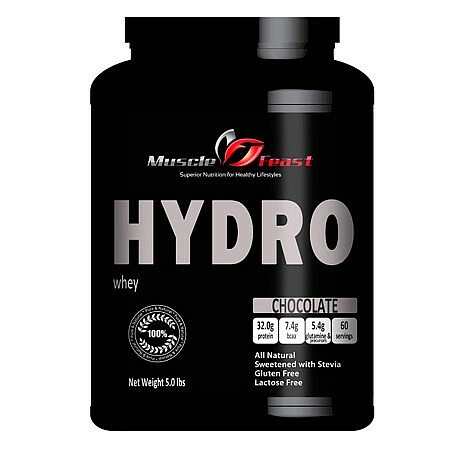 This Hydrolyzed whey protein is the highest grade of hydrolyzed whey available. This is a pure pharmaceutical grade hydrolyzed whey with a 90% protein content. It is guaranteed to be the freshest and purest Hydrolyzed Whey Protein available. Our unflavored Hydrolyzed whey protein contains an amazing 34 grams of the highest biological value protein per 38 gram serving with virtually no fat or carbohydrates. Warning: Our Hydrolyzed whey protein has a bitter taste and is not recommended for people that are not accustomed to taking a high end hydrolyzed proteins. The advantages of hydrolyzed whey protein are it is very fast absorbing; typically 10 minutes or less compared to 30 minutes for non hydrolyzed whey and it very easily digestible and considered to be non allergenic. • Mixes very good with water, juice, milk, sport drink, coffee, yogurt, oatmeal, etc. No Artificial Sweeteners and Virtually Lactose Free: This is the purest form of hydrolyzed whey protein available. Made from 100% American USDA Grade A milk. This product contains no artificial sweeteners or flavors of any kind. Our whey protein is manufactured using a 100% cold temperature process, which keeps its micro-fractions intact and protects the integrity of the amino acid profile. Other than whey protein which comes from milk, this product contains no animal-sourced ingredients.